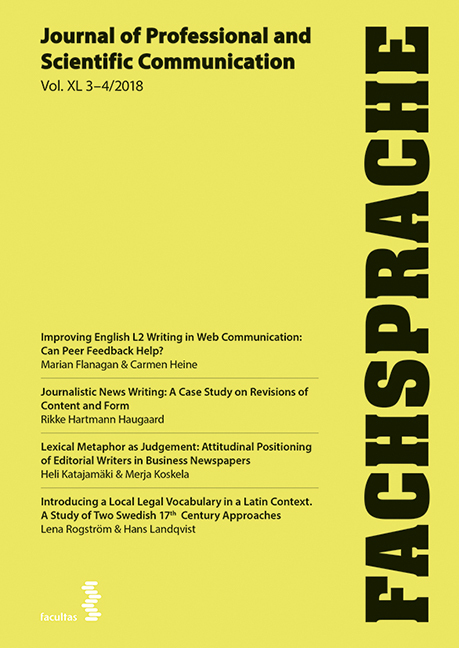 Drawing on appraisal theory, this paper aims to analyze how the attitudinal positioning of writers of the editorials of business newspapers can be construed by means of lexical metaphors. The focus is on judgment, the evaluation of human actors, because it indicates the subjective presence of a writer. Based on a dataset o3f 32 editorials of two Finnish business newspapers, the results show that the lexical metaphors used during assessments are mostly dead metaphors, representing the source domains of competition and sports, humans and animals, and war, battle, and violence. The most common targets of judgment are institutional actors that are described by the meanings of capacity, tenacity, and propriety. Economic actors are mostly evaluated positively while political actors are mostly evaluated negatively. Cases where economic actors are evaluated negatively and where individual persons are mentioned are unusual but do arise. In general, judgments in editorials reflect the shared values and ideological beliefs of the papers and their readers. Lexical metaphors offer a subtle way of praising and criticizing institutions and individual people, which makes them an important way of communicating as expected in a discourse community. Katajamäki, Heli, und Merja Koskela. 2018. Lexical Metaphor As Judgment: Attitudinal Positioning of Editorial Writers in Business Newspapers. Fachsprache 40 (3-4), 141-61. https://doi.org/10.24989/fs.v50i3-4.1479.